Growing up, I ate peanut butter and jelly sandwiches in my lunch more times than I can count. I still love the combination of sweet, fruity jam and savory, sticky peanut butter whether I’m enjoying it in a sandwich or in a PB&J-inspired dessert. 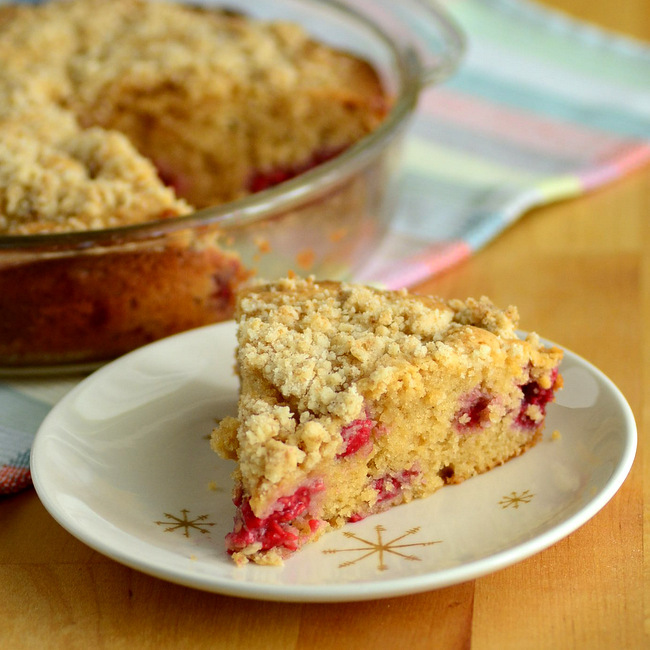 ThisÂ Peanut Butter Coffee Cake with Raspberries is a brunch option that is inspired by this classic sandwich, featuring a peanut butter cake that is studded with fresh raspberries and topped with a buttery streusel. The batter for this cake is very easy to put together and can be mixed up in just one bowl. That being said, a small portion of the dry ingredients should be set aside towards the beginning of the recipe so that they can be turned into a bit of streusel for the top of the cake. Coffee cake is always better with streusel, isn’t it? There is a nice dose of peanut butter in the cake batter and raspberries are folded in after the other ingredients have been combined. I used fresh raspberries in this cake and prefer to use them, when they’re available. If fresh raspberries are not in season, you can use frozen berries. When using frozen raspberries, use them from frozen – not thawed – and try to get the cake into the oven quickly after mixing it up so that the berries don’t start to soften. In fact, if I’m using frozen berries, I would recommend making the streusel before finishing the cake batter and not the other way around. Your cake also may need an additional minute or two in the oven to bake through completely. Still, it will be just as tasty whether it is made with fresh or frozen berries, so feel free to use whichever is more convenient for you. This cake is light and tender, with a nice balance of savory peanut butter and sweet-tart berries. It will absolutely evoke the flavors of a peanut butter and jelly sandwich, even though it is a lot less sticky than the “real” thing. The cake can be served when it is still slightly warm from the oven, or allowed to cool to room temperature. The cake is best within a day or two of baking. Preheat oven to 350F. Lightly grease an 8-inch round cake pan. In a large bowl, whisk together flour, baking powder, sugar, brown sugar and salt. Remove 1/4 cup of mixture and transfer to a small bowl, then set aside. To the large bowl of flour mixture, add in vegetable oil, egg, peanut butter and milk and mix until well-combined. Stir in raspberries, then pour the batter into the prepared pan and spread into an even layer. Add softened butter to small bowl containing the remaining flour mixture and use a fork to cut it in, until the mixture resembles wet sand. Sprinkle evenly over the top of the peanut butter batter. Bake for about 40 minutes, or until a toothpick inserted into the cake comes out clean and the top springs back when lightly pressed. I’ve never made a peanut butter coffecake – I’ll be making this soon. But I’ll use strawberries instead of raspberries (personal preference). Thanks for another great recipe! I never tried mixing berries into a peanut butter cake – looks so delicious I just have to try it soon!